If you follow Mr. Faisal Qureshi at the Television Networks, I would prefer that you stop reading this post further. If you have been a big fan of his “Youth Responsibility” talks, I would request you to please click the “close” button and navigate away immediately. always ends up on not littering, driving lessons and what not.Ok fine, we are uncivilized citizens living in a jungle but is this the only responsibility we have as a nation? On 23rd October 2008, while sitting on a comfortable chair of the FAST-National University, Lahore Campus’s Faculty Meeting Room at 7:00 p.m. with representatives of 3 top event management companies and one of the socially conscious CEO of our motherland, I was thinking something and wondering if Sir Faisal has ever wondered why people like me come again and again to listen to him. I wish it would be have been great if i would have attended sessions of Ms.Marryam Chaudhry (M.D., Corporate Communications) instead who was just sitting right opposite to me. 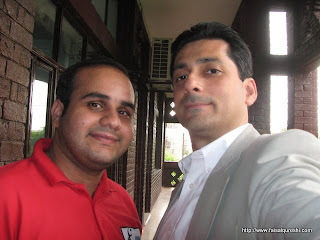 People like me know Sir Faisal as C.E.O. of Kolachi Advanced Technologies, Managing Director of Blue Ice Technologies and nonetheless as one of the successful entrepreneurs in Pakistan. We, the engineers, computer scientists and business administration students look up to him as a mentor but he has other issues at his hand to take care of. He wants to tell this educated minority that they have created all the mess and they should be ashamed of it. What about the majority that is creating all the fuss? I know i am an animal but I do not smoke, I don't eat "PAAN" and we are the minor crime partners in all what he has been blaming us for. We are not the targeted audience. Sir Faisal is lecturing those people who'll eventually leave this country and his efforts and time would go to waste. Perhaps if I come to the point straight, Sir Faisal is also a partner in making people leave the country because being the head of 2 technology companies, he never lectured multinational and his colleagues about the "Corporate Social Responsibility". Does "Corporate Social Responsibility" only means that you have to donate to Edhi Foundation, fund ads of Fatmid and other NGOs.No Sir No! I don't know Sir Faisal's view point on CSR but all i know is that none of these CEO's have ever done any serious effort in retaining the youth within this country because they too are SELFISH. Though i am exactly half of his age at this moment of time, but i have been through the CSR policies of all major Telcos, Multinationals, Banks, Software Houses and Engineering Firms. "Educate A Child" programmes and what not? But what about the people who as per their college or university degree are considered as "educated". Few reasons that why educated lot moves out of the country and becomes "parasites”. The amount of money these graduate students take home after all the hard work, bills and related taxes is peanuts. Government takes income tax and what not but fails to provide medical and other facilities which are normal outside the Pakistani territory. Same is the case with the corporate sector. These engineers and technicians are offered about $5000-$9000 salary with all other facilities outside the country and thus they move out for a good future because eventually they have to support their existing family members as well as raise their own family. "Cleaning Walls" would be of what use to most of us? Lets take Pakistan as a wall of height 20 ft..Considering that i am 6 ft. tall, without a ladder I would only be able to reach the max height of 7 ft. At that 15-20 ft. height, our leadership and future leaders who are currently being educated at Cambridge and Oxford would come and would throw paint balls to spoil what i have cleaned. They'll drop black paint from that height and this would eventually affect the wall that i have cleaned up till 7 ft. All of us know that children of these "OWNERS OF PAKISTAN" would come after getting foreign degrees and would be made the Ministers. Pakistanis have been made to understand that these are your limits and we are the land lords. You are peasants so never ever try crossing us if you want to live here else you are welcome to move to the other land. Why don't these CEOs show some social responsibility in making "Leaders". Making the youth stand against those forces who'll come from outside and start ruling us. Have they ever tried contributing for an Innovation, development of Incubation Centers or Social Services Centre for the nation to contribute back? 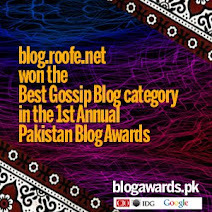 At least people like us can develop products and solutions in order to make the life better for the people of Pakistan. We can commit 3 hours a day for developing technologies that could help Pakistani public.CAP (Citizens Archive of Pakistan) as he covered in one of his programs is doing a similar job. If this is done, the youth would take ownership of these community projects or I would say one day taking my kids around the city i would say "We developed Traffic Solution for this area which was funded by some ABC Software Solutions and XYZ Engineering Firm and then we eventually gifted it to the Government of Pakistan". However, if you'll go to these socially responsible organizations and ask for sponsorship in terms of Drama, Concert or Fashion Show, from Brand Managers to Marketing Managers to CEO's everybody would be interested to pour everything for partying. But why they hesitate in contributing to projects that add to the development of society and the young educated lot? I have been attending Startup Insider sessions of P@SHA and other organizations. I would also like to acknowledge their efforts of developing the entrepreneurial germs inside me. The speakers who are mostly CEOs would encourage you to be entrepreneurs, do something mind blowing but after these sessions whenever some of them are contacted to help in setting up the own company or proper mentoring, they'll show you cold shoulder or would want you to develop the idea for them which they'll eventually sell out as their organization's product. We are producing 8000 engineers a year whereas India is producing 500,000 engineers a year and all the educational institutes and organization there term it as their social responsibility to place these students in the right organizations. Mostly the organizations select their targeted talent in his/her 3rd year at the undergraduate school and start working on them. Here, its been 6 months and most of my batch mates having sound knowledge of Telecom Engineering are helpless and jobless.T hey are ready to work free for organizations but no one wants them to even enter their premises as they don't have any "reference". If they try to do a start up, nobody is there to help them financially and morally. One of my friends who never wanted to leave this country even if he would have got minimal pay, had to move out because of the HR managers of these top multinationals and "socially responsible" organizations. What he said to me before his departure was "Rafaeel! Friend, I always wanted to clean up this whole dirty car (Pakistan) but they didn't even let me wash the tyres. My father has retired and we both have found jobs outside the country and I am relocating just because they don't put faith in me. I would even advise you to relocate because at least they give us the opportunity to earn bread and butter." His words seriously made me weep that day. "Son! If you have got that fire and spark inside you, I would mentor you in setting up your own firm and making a difference"
He's a techy guy but his organization perhaps never felt it necessary to take responsibility of few students and develop them as leaders. Here, I would like to appreciate those institute professors like Dr. Umar Saif (SCI) and NUST's Technology Incubation Centre director who are more socially responsible than the CEOs of these Socially Responsible Firms in Pakistan. Did Ma'am Reema and the other partners from her company ever thought about instructing some FREE courses for the "Management Students"? Did Adnan Bhai ever open himself to mentor students who want to know about TV Production? The answer would be perhaps "NO" because all of us seem to be very busy and selfish. We would never ever want a kid of today to bring his/her own firm and enter the competition. This is how much socially responsible we are. What i have to say to my first love?